Pendulous branches of deep green needles offer the balance of vertical interest and softly flowing grace to the garden in one plant. 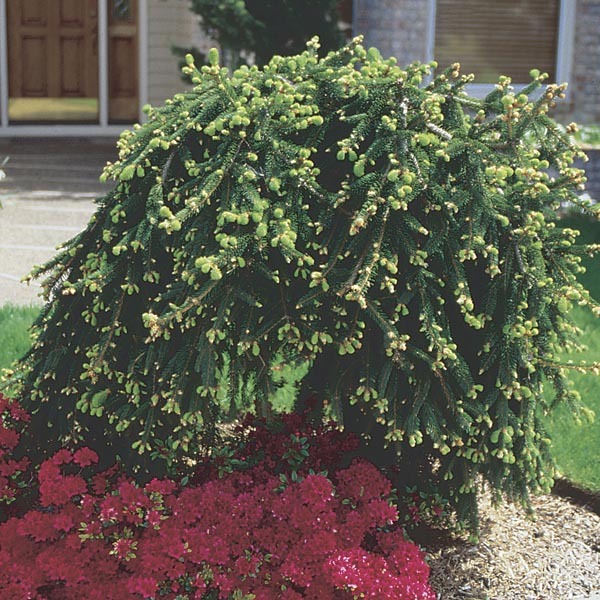 This stunning evergreen is perfect for providing year round form and color in the landscape. Beautiful amongst mounding and low growing plant companions. A classic favorite for landscape focal points. Provides dramatic color and form to autumn and winter landscapes. Best used for large scale plantings. Apply a balanced fertilizer formulated for acid loving plants. When planting, keep the base of the trunk exposed. Plant in a reliably sunny spot. Performs best in slightly acidic, organic-rich soil. Water regularly until established.